It's 90 degrees this week in Philadelphia but we are jumping into Fall head first. I'm looking forward to breaking out that cinnamon and nutmeg and getting back into the kitchen. I've got a lot of ideas bouncing around in my brain for Fall recipes—pumpkin ice cream cake, pear galette, chai white russians—but let me know if there's anything you would like to see this season! We're kicking off Fall recipes with these Chai Snickerdoodles because we're not quite ready for pumpkin everything yet and I haven't made it to the apple picking yet. On an unrelated note, every time I've typed "chai" during this blog post, I've most definitely typed "chia" and had to go back and fix it. But we're pushing through! Preheat oven to 350 degrees. Line a baking sheet with a nonstick baking liner. In the bowl of an electric mixer, cream butter and sugar until fluffy (about 5 minutes). Add in eggs one at a time and mix until combined. In a separate bowl, combine flour, cream of tartar, salt, and 1 teaspoon of cardamon. Add dry ingredients to the butter and mix until dough is formed. Chill dough in the refrigerator for 5-10 minutes. In a small bowl, mix together 2 1/2 tablespoons of cinnamon, 3 tablespoons of sugar, and 1 teaspoon of cardamon. Once dough is chilled, begin forming balls of dough that are 1 tablespoon in size. Roll each dough ball in the cinnamon, sugar, and cardamon mixture and place 1 inch apart on the baking sheet. Bake for 10-12 minutes or until the bottoms just begin to turn golden brown. Let cool on the baking sheet for 5 minutes before cooling completely on a cooling rack. Store in an airtight container. 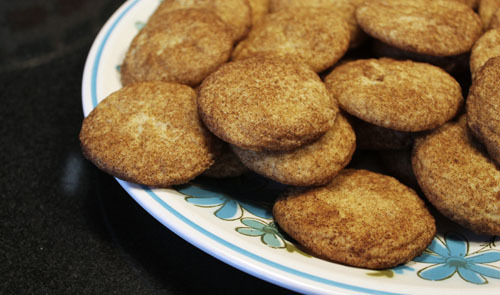 Snickerdoodles have to be my favorite cookie. As much as I like a freshly baked oatmeal or chocolate chip cookie, I always get tired of them and move on. 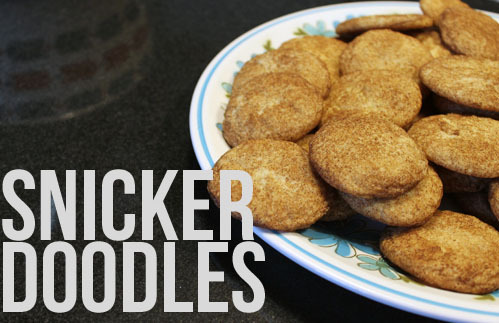 This is not the case with snickerdoodles. I could eat tons and tons of these, and when I made this recipe, I basically did. Don't tell. Here's the recipe. This recipe is from adapted from here. 5. Chill dough, and chill an ungreased cookie sheet for about 10-15 minutes in the fridge. 6. Meanwhile, mix some sugar and cinnamon in a small bowl. Or use already mixed cinnamon sugar. Now this recipe has it yields 24 cookies. I had tons! Much more than 24 so if you are worried about eating the whole batch, be prepared! So good... I dare you not to make these.